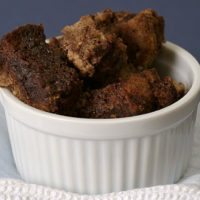 Chai Spice Bread Pudding with Vanilla Sauce is an amazingly delicious dessert featuring a wonderful blend of spices and a buttery vanilla sauce that’s completely irresistible! 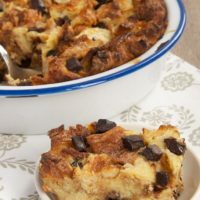 One of my favorite go-to desserts for its simplicity and for happy guests is bread pudding. It’s a simple thing to prep with simple ingredients. 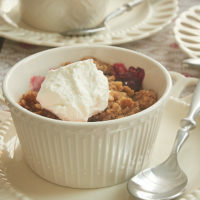 And it usually needs to chill before baking, making it a great make-ahead dessert. All of that and more is why I love this Chai Spice Bread Pudding with Vanilla Sauce. 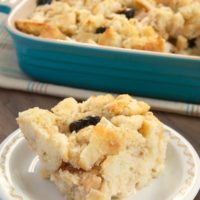 At its heart, this is a fairly straightforward bread pudding. It’s just bread plus eggs plus a sweetened, spiced milk mixture. What makes it special is the blend of spices mixed into it and the sauce. Put all of that together, and you’ve got one fantastic dessert. 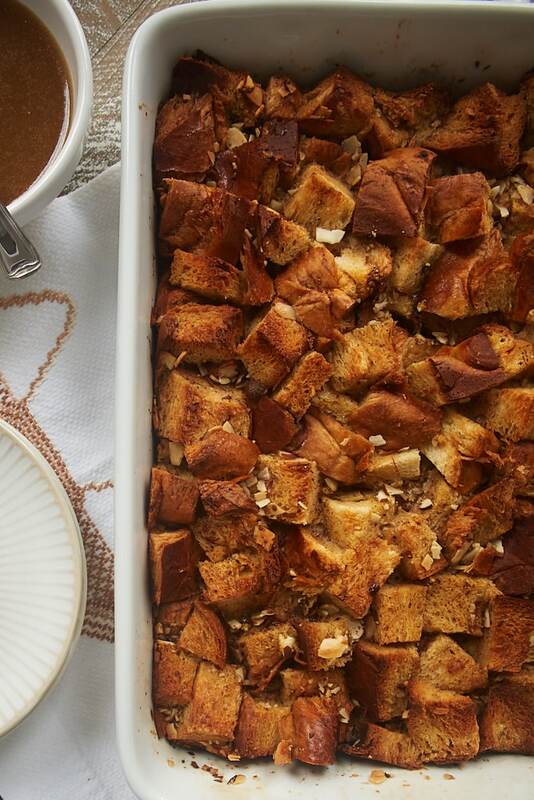 The chai spices in this bread pudding are a variation of my usual blend. I often use a bit of ground black pepper in my chai spice blend, but I opted to omit it here to keep the flavors a little more subtle. It’s similar to my Fall Spice Blend, but with different ratios of the spices. If you have a favorite blend, you can certainly use that if you prefer. I often use challah for bread puddings because I like the texture and flavor. I often have leftover challah from using part of a loaf for something like French toast. That means the remainder often turns into bread pudding. If you don’t have access to challah, I’d recommend another bread made with eggs, like brioche. Don’t miss out on this sauce, y’all. 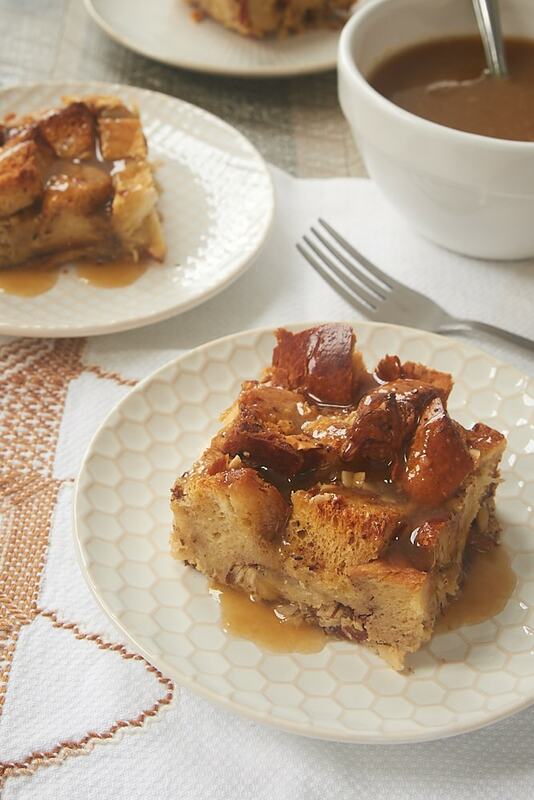 It has such rich, amazing, buttery flavor that’s a wonderful complement to the subtly sweet and spiced bread pudding. I seriously just want to spoon it over everything. It’s made with some basic ingredients that you’re very likely to have on hand. It just needs a little bit of stovetop time, and it’s ready to serve. If you’re prepping in advance, this sauce will reheat well, too, either on the stovetop or in the microwave. 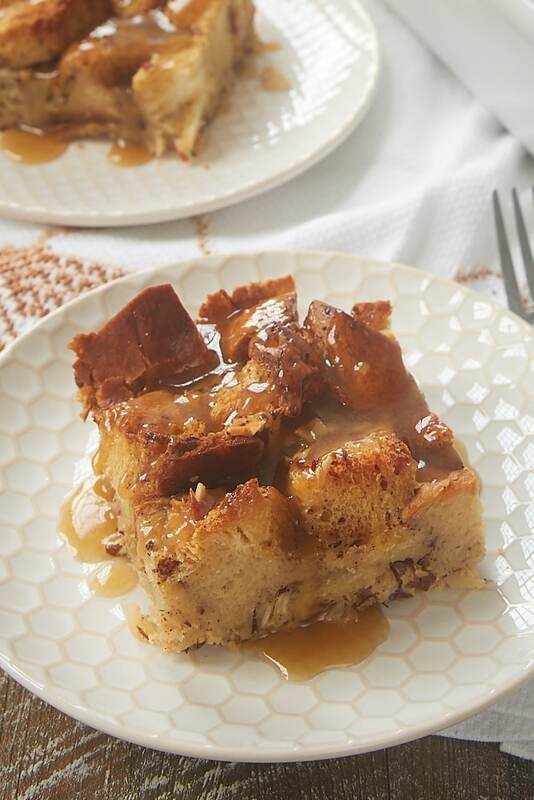 If you’re a fan of warm, comforting spices and big doses of vanilla, then I think you’ll really enjoy this Chai Spice Bread Pudding with Vanilla Sauce. A warm slice topped with a little (or a lot!) of that sauce is one of my favorite comfort dessert indulgences. I hope you’ll enjoy it, too! 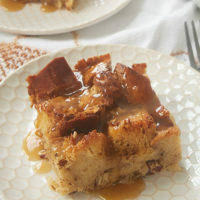 The delicious spices and amazing sauce make this Chai Spice Bread Pudding with Vanilla Sauce a favorite! Place the cubed challah in a greased 9″x 13″x 2″ baking dish. In a large bowl, combine the milk, brown sugar, eggs, vanilla, cinnamon, cardamom, ginger, allspice, nutmeg, and salt. Pour over the challah, making sure that the bread is completely covered by the milk mixture. Sprinkle the almonds on top. 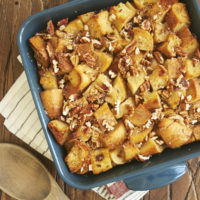 Set out the chilled bread pudding while you preheat the oven to 350°F. Bake 40 to 45 minutes, or until a knife inserted into the center of the pudding comes out clean. Place the butter, sugar, brown sugar, cream, and salt in a heavy saucepan*. Cook over medium heat until bubbly and thickened (about 5-8 minutes). Remove the pan from the heat. Carefully stir in the vanilla. Spoon over servings of warm bread pudding. 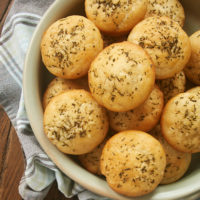 *The mixture will be fairly bubbly while it cooks, so be sure to use a large enough pan. Vanilla sauce recipe slightly adapted from Land O’Lakes.